Thinking of getting the latest Apple smartphone but are a little put off by its use of the iPhone 5 nano sim? Well we’ve got you covered. The nano sim is a new industry standard that was approved just last spring and yet, Apple has decided to already include it with the iPhone 5. While it does lend the iPhone 5 some form of exclusivity, problems may arise when you decide that you want to use a different phone and realize that your sim now just won’t fit into the dang thing. That’s where iPhone 5 nano sim adapters come in. Third party accessory manufacturers understand that people may sometimes need to move their sims across units for different purposes such as when you’re travelling and probably would like to leave your very expensive iPhone 5 behind for a phone that you’d feel a little more safer carrying. Now, you won’t have to give up having any form of communication or buying a prepaid sim; just slip in your iPhone 5 nano sim into one of the adapters and you’re good to go! 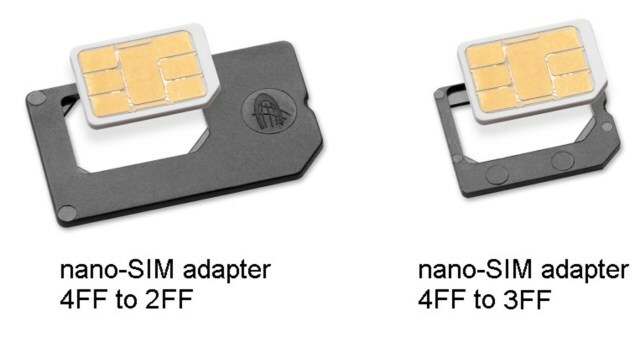 We’ve checked and it looks like there are many different brands of iPhone 5 nano sim adapters available online that will covert your iPhone 5 nano sim to micro and even regular sim sizes. Even UK telecom carriers Three and Vodafone are preparing for the possible high demand by stocking up on these items. It’s also a way for them to ensure that no matter what sim you’re using, it’ll be compatible with all their devices. Online shops are selling the adapters for anywhere from €2 ($2.60) to €12 ($15.60), depending on how many you’ll get. Best to pick up an option that has both the micro and regular sim converters to make sure you’ve got the right adapter no matter the situation.